Pierre's Fine Pianos represents some of the world's most renowned and exclusive brands including, Fazioli, the Bugatti of pianos. The one-and-only Fazioli Aria has just arrived in our showroom after a two-year building process. Designed by famed French designer Philippe Gendre, this is the only one available in the world. No piano has ever gone where Aria resides: the summit of innovation and supreme piano engineering. Aria's groundbreaking key design features - triangular motif, upsweep chrome body, inverted pyramid pedestal and unique aerodynamic shape embody a timeless, elegant and luxurious lifestyle. 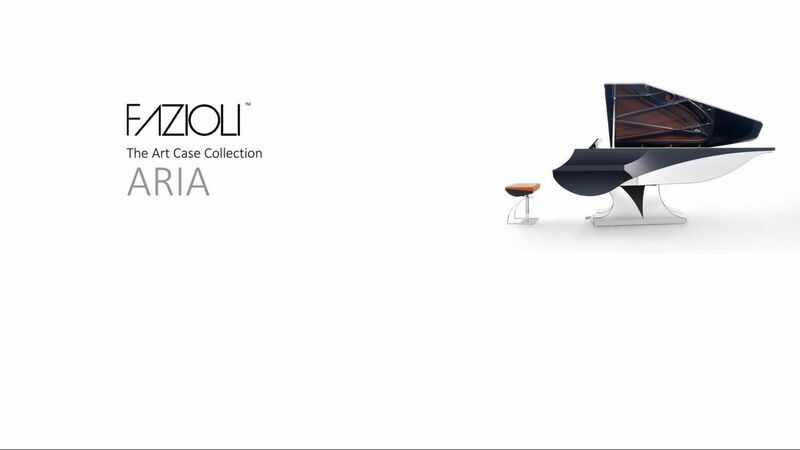 While the Italian word "aria" simply means "air," behind Fazioli Aria's "floating in mid-air" aerodynamic appearance, its design elements also encode a musical secret – speaking with one another, being that is Aria! The massive chrome pedestal has inverted inlay triangles on every side and also conceals pedal mechanism – thus unifying and simplifying the overall visual statement. The black and chrome combination punctuated by triangle-derived motifs evoked Art Deco, placing this marvelously futuristic piano in the realm of the Chrysler Building of the future, or a skyscraper yet to be built. 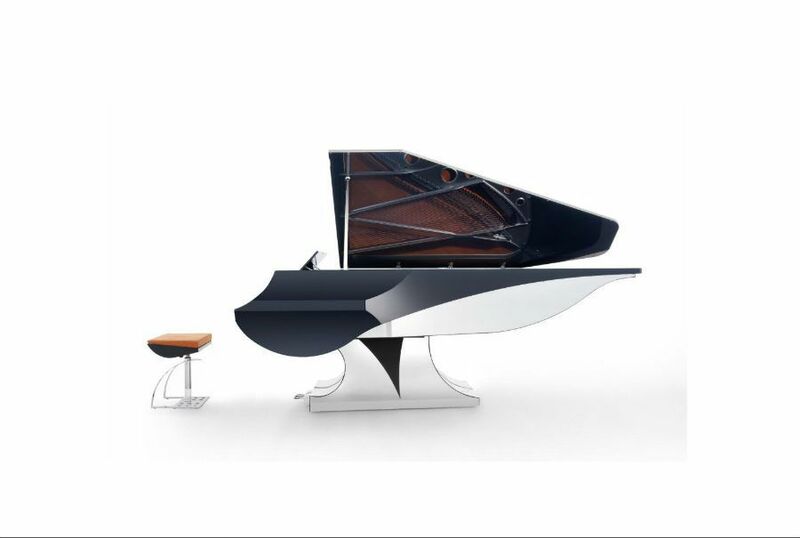 The lid is held by a chrome stick and the ebony music stand is one with the piano creating unity of purpose and simplicity of a design statement. The squared off tail and side of the top of the piano create almost a triangle once the lid is open – just like a sail of a boat outlined against the sun. 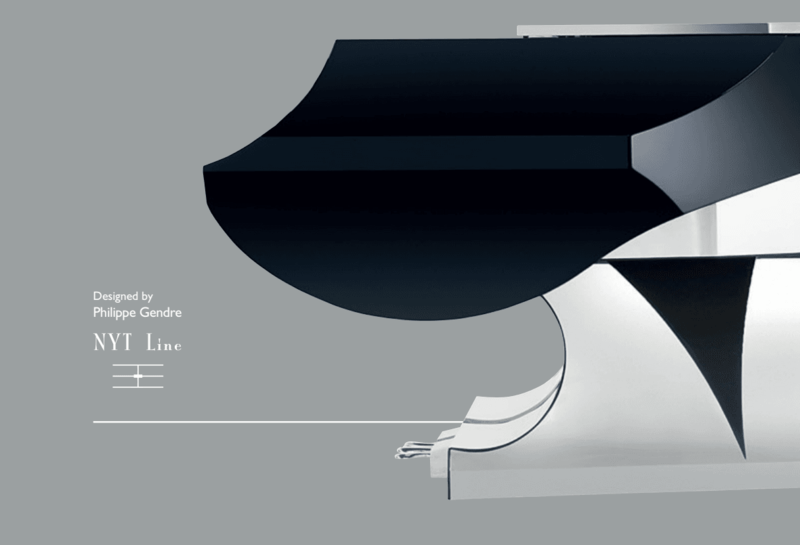 The grand proportions of the length to the height of the piano create an illusion of ‘sailing’ over the air – with the chrome details serving both as light reflectors and the texture counterpoint to the sleek ebony of the upper body of the piano. The poetry of air and earth, metal and wood are what Rockefeller must have envisioned when designing the iconic New York center. And so Aria is sure to inspire many great creative ideas, from musical compositions to the entire building and sets that will be fortunate to call themselves home to this truly magnificent creation. Shapes and colors blend into one another to form a single dynamic whole that recalls the design of a wave, the silhouette of a fish and the flight of a bird. This instrument lives in the air, together with the sound it produces. Its asymmetrical shape is striking and distinguishes every angle, each different from the last, sparking a playful exploration of “tidy disorder.” The piano with its single support creates sustained, dilated acoustics which extend beyond the traditional duration. The low notes reach an unprecedented depth and fullness thanks to the confirmation of the basement. With Aria, sound takes flight.